The Refine jacket by Mario Barutti is cut from Super-fine, lightweight Harris Tweed, 20% lighter than our classic Harris Tweed. The Refine jacket is lighter and more versatile, and is suitable for use all year round. 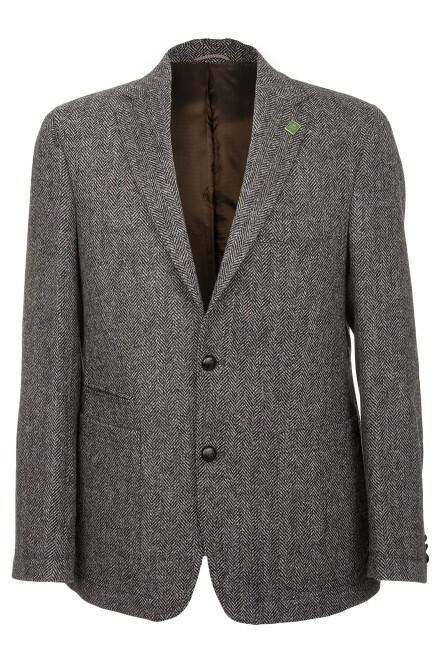 An ideal partner for both formal and casual wear, the Refine jacket is a signature piece for any man's wardrobe. Suede elbow patches with a raised seam definition offer a smart new twist on the traditional elbow patch. With striking Orb motif buttons, and a suede storm tab, the Refine jacket shows the sort of attention to detail that we expect from all our garments. Green enamel lapel pin featuring Harris Tweed Orb. Classic Herringbone pattern in charcoal with blue tones, grey suede " signature " design feature elbow patches, storm tab and striped under collar. Leather buttons with Orb motif. Large " Heb Man " check pattern in charcoal and grey with contrasting claret suede elbow patches, storm tab and striped undercollar. Metal buttons with Orb motif. A Classic Herringbone pattern in muted brown and beige with fawn suede elbow patches, storm tab and striped undercollar. Leather buttons with Orb motif.